The presence of Internet Blast on your system will result in the profusion of third-party commercial advertisements. You should take all the necessary steps to remove this adware program, because its functionality is restricted to bombarding target browsers with coupon deals, discount offers, and other annoying commercial offers. If you do not take the immediate action to delete this program, you will be forced to put up with windows popping up or banners flashing all over your screen. Internet Blast might significantly decrease the speed of your web browser, which, in turn, will result in the reduced efficiently of your work. So, we recommend that you terminate this advertising-supported program, as we are sure you will soon want to go back to the previous ad-free condition of your browser. Compatible with Internet Explorer and Mozilla Firefox – the newest version of Google Chrome is known to block the application – Internet Blasts manifests itself as a browser add-on when it reaches target systems. After the installation, it will not take long before it starts unleashing the third-party ads. Security experts recommend that you remove Internet Blast, as it has been noticed that this program might serve unreliable links. For example, you might see ads promoting fake software updates, or clicking one of the ads might open up additional pages containing more adware. As you might never know what lies on the other side of the featured links, you should remove this adware program in order to avoid any unpleasant surprises. On top of that, Internet Blast is known to install tracking cookies that collect and process data about your online preferences. Generally this data is limited to risk-free non-personally identifiable information. However, it does not mean that Internet Blast might not be utilized by malevolent parties to take hold of more sensitive information that could be used to identify you, or utilized to your disadvantage in some other way. According to the experts, Internet Blast can also connect to the Internet without your permission, which is another fact that suggests suspicious nature of this application. Similar to Package Return, Number Ascend, Primary Color and other applications developed by SuperWeb LLC, this adware app reaches its target PCs via software bundles distributed on third-party download sites. The method how this application gains access to systems is notorious for the high amount of malicious content it is used to spread around. 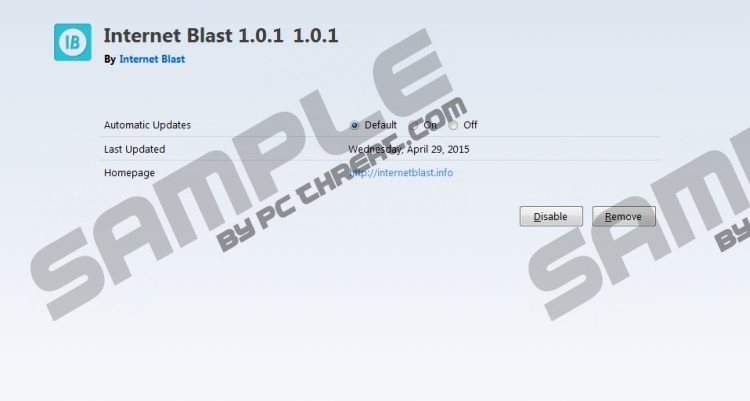 So, you have another reason not to trust Internet Blast, and thus remove it immediately. You can do this by uninstalling this program from Control Panel (see the instructions below). Even though the process seems effortless, and is enough to terminate the third-party ads, we strongly advise that you complete the removal by running a full system scan with professional antimalware software. Go to Programs and Features and choose the program you want to delete. Click the Start button to open Start menu and choose Control Panel. Open Programs and Features and select the application you wish to remove. Click the Start button to open the Start menu and go to Control Panel. Choose Add or Remove Programs and highlight Internet Blast in the list. Quick & tested solution for Internet Blast removal.